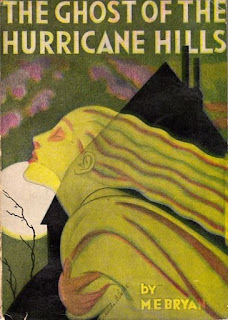 The Ghost of Hurricane Hills is yet another book in what started out as my plan to read American literature written since the 18th century. I figured I'd be reading the greats, but I'm having way more fun following the less-traveled path of little-known, more obscure novels. Author Mary E. Bryan (1838-1913) evidently killed it as a writer of dime novels; clicking here leads to a list of her work. I don't have the later, softcover edition pictured; mine is a 1933 leather-bound pebbled cover from Economy Book League of Cleveland. "From the mid 19th to the early 20th century, the fiction genres known as dime novels, penny dreadfuls, and story papers flourished in England and America. The increasing mechanization of the printing process, more efficient distribution methods, and a rising literacy rate all contributed to this publishing phenomenon. Printed on the cheapest of paper, with lurid cover illustrations, dime novels (which found a name in their ten cent price tag) and story papers were considered ephemeral, to be read, often in secret, passed on to friends, or discarded. These delightful items, ancestors of the ubiquitous mass-market paperbacks of today, reveal the reading tastes of a population often neglected in historical studies.... Dime novels and story papers targeted a youthful working class audience with their thrilling, stereotyped tales of Wild West adventures, master criminals, detective stories, historical romances, and working girls and boys in which virtue was rewarded and preserved." I love finding these old books -- as the librarian at the USF page goes on to say, they were "once the bane of the middle class," and they "were considered the corrupters of youth and stepping stones on the path to perdition." My book even has a disclaimer in the front that it is "not recommended for children." Funny how times have changed; reading them now it's often hard not to laugh at what was considered too mature for kids. These books are also quite tame in comparison with what's out today; however, I love discovering new old books and the dime novel speaks to the "reading tastes of an increasingly literate working-class audience," so I also get the benefit of immersing myself in what large numbers of people were reading at the time. I get that not a lot of people likely share my enthusiasm about these old, forgotten and obscure novels, but well, it is what it is. I love this stuff. 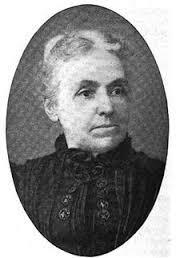 Mary Edwards Bryan, from Wikipedia. In The Ghost of Hurricane Hills, we have a story that just oozes Gothic; there's no castle here to speak of, but there is a "haunted house," a lost treasure, a journey to the underground and definitely a heroine. It begins with the dying wishes of an elderly man named Colonel Charnley. Evidently, he had built his fortune "on the ruins" of another man who had married the only woman Charnley ever loved. Now that Charnley is at his end, he has left his vast fortune to the daughter of that woman, who is now an orphan living in Florida. He plans to send her to school, and not reveal that she is worth a fortune until her education is finished. This doesn't make his protégé very happy at all; young Frank Norman had banked on having that money all to himself. Charnley, though, realizes that making Norman his heir would have made him "indolent and purse-proud," and leaves him only five grand. As Charnley draws his last breath, he calls for his lawyer, Barclay Hampden, telling him quietly that Norman is not to marry the girl, ever. Eventually, Charnley and Norman find young Amy, share the plans to get her set up in school, and she's thrilled at the prospect. On the way home, the trio makes a brief stop for Norman's benefit, as he wants to visit his boyhood home. It seems that he has some sort of "possible wealth" hidden there, and intends to search for it. This detour is the start of a terrifying adventure for young Amy, who while visiting the run-down house that has a reputation for being haunted by a ghostly "woman in gray," is visited by an apparition that she follows into the woods. Her pursuit ends up with her being lost; although a major search effort is made, Norman and a heartbroken Hampden have to eventually admit that she has simply vanished. So pretty much right away the reader is presented with several mysteries, which only deepen as years go by. While I won't give away what actually happens in this book, the subtexts run on several different levels. Justice for wronged women is one biggie, while another line explores how women had to be hidden away rather than be out in the world because of some past misdeed. Then there's the question of marriage for love or for suitability among the upper classes which also comes into play, as does good old upper-class materialism and greed. In telling her story, it also seems to me that the author also makes great use of the Eurydice myth here, especially in having her Eurydice emerge as is explained here, "as a shadow, waiting to come to light to become a full woman again." Sadly, I can't divulge exactly how or why this comes about, but it is about as obvious to me as the steam rising off of my coffee at the moment. There is much, much more, but it's time to move on. "Dorothy Richardson, a middle-class reformer and journalist who wrote about the working women's experiences in the factories in 1905 also provides a valuable clue about readership. In her book The Long Day she chronicled occupations open to young working-class women. She herself held various jobs around New York City, partaking in the work and meeting the young women who held these jobs. She often asked them what their tastes were in reading and when she learned they read Laura Jean Libbey, Charlotte Brame, and Effie Rowlands she called it 'trashy fiction' and encouraged them to read middle-class favorites such as Little Women or works by Charles Dickens. Readers apparently did not take kindly to her efforts to improve their taste. She reported that they rebuffed her attempts to 'elevate' their reading habits and told her not to put on airs with them." For me, it's kind of cool to be off track and to be bypassing what's generally considered the best American novels; this book may not be great literature but it and others like it are definitely part of American literary/reading heritage and history. It is also a part of American women's history, and just because it will probably never end up on a course syllabus somewhere doesn't mean it's not worth reading. It is.